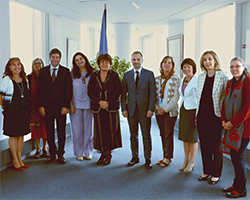 On 5 July 2018, Minister of Health of the former Yugoslav Republic of Macedonia Dr Venko Filipce visited WHO/Europe in Copenhagen, Denmark. Dr Filipce’s first visit since his nomination provided an opportunity to explore common public health interests with members of the WHO/Europe leadership team, and to discuss ways in which WHO/Europe can strengthen its collaboration with the country. Primary health care was one of the key areas Dr Filipce and Dr Zsuzsanna Jakab, WHO Regional Director for Europe, focused on. The Minister of Health outlined the current plans of the former Yugoslav Republic of Macedonia to develop a programme of home-based services. Dr Jakab confirmed that home-based care is a cost-effective option to strengthen primary health care and to meet the health needs of the population, especially those of the elderly. The Regional Director also emphasized that the country can look to good examples of both primary health care and home-based care from various countries in the Region. She noted that it is essential that any health system reforms respond to the country’s current health challenges. Dr Jakab introduced WHO’s 13th General Programme of Work (GPW13) and underlined that the achievement of universal health coverage is the Organization’s overall strategic goal. This involves integrating disease prevention and health promotion, public health services, and financial protection. The GPW13 places an increased emphasis on WHO’s work in and with countries. Strengthening the Organization’s country office capacity will therefore be a priority for WHO/Europe over the next years. The discussions throughout the day covered a variety of topics. They concluded with the confirmation of a shared commitment to continued collaboration to ensure better health and well-being for everyone in the country.